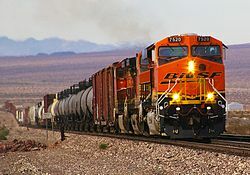 BNSF Railway (January 24 2005), BNSF Adopts New Corporate and Subsidiary Logos and Changes Name of Railway Subsidiary as Part of Tenth Anniversary Celebration. Retrieved January 25 2005. BNSF Railway (February 9 2005), Port of Los Angeles begins discussions with BNSF Railway Company on new intermodal facility. Retrieved February 10 2005. ^ BNSF Railway (June 7, 2006), BNSF Railway Asks Rail Fans for Cooperation to Keep America's Rail System Safe. Retrieved June 29, 2006. ^ BNSF Railway (January 24 2006), BNSF Announces $2.4 Billion Capital Commitment Program for 2006; About $400 Million Again Slated for Track/Facilities Expansion. Retrieved January 30 2006.